News had broke earlier his month that Lech Walesa, the Polish politician and trade-union organizer who served as president of Poland during the fall of the Soviet Union, supported the Occupy Wall Street movement and was planning on attending a protests. As I had written before, the Occupy movement has been under attack by conservatives because they view this is a serious threat to their own agenda. 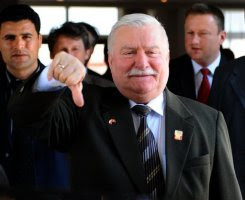 Now conservatives are setting their sites on prominent Occupy supporters like Walesa to try and discourage them from attending any protests or offering any future support. We suspected that the European news media had filtered out accurate information about the genesis of Occupy Wall Street (OWS). When Walesa’s comments hit the AP wire last week, my team immediately reached out to our Polish contacts. We made the point that the political themes of Occupy Wall Street may have started out with some of the principles that we share, but OWS themes were rapidly being morphed into anti-freedom and anti-liberty messages. At the core is the want for a big, powerful central government to dominate the lives of individual citizens. Using biggovernment.com plus other news sources, rapidly we painted an accurate picture of the groups training, leading, and organizing the “movement.” The movement is organized by anarchists, Code Pink, the American Communist movement, jihadists, anti-Israel, socialist, and anti- free enterprise interests. OWS folks are politically to the left of President Barack Obama. Based on our discussion and intervention, President Walesa is not going to get involved with the OWS. He is not comfortable with the “organizations” behind the movement. It was not a difficult discussion. The Nobel Peace laureate told The Associated Press that he is planning either a visit or a letter to the protesters. "I am weighing now how and when to best support them, without doing any harm," Walesa said Thursday. Since mid-September, the protesters have besieged a park near Wall Street to rally against corporate greed, saying that is the main cause for the U.S.'s failing economy. Similar protests are planned across Europe this weekend, including in Poland's capital, Warsaw. The 68-year-old Walesa said the global economic crisis has made people aware that "we need to change, reform the capitalist system" because we need "more justice, more people's interests, and less money for money's sake." "We cannot accept a situation when capitalism is making huge money and then does not know what to do with it," Walesa told the AP. "It should invest in new jobs." "People are most important," he said. The legendary freedom leader said employees, employers and representatives of state and local governments should get together to work out solutions that would best serve the people and the societies. "For now, capitalism is working to produce more money but does not see the people," Walesa said. "This problem is getting worse across the world." So how exactly does Andrzejewski sway Walesa to not support the movement? He claims he provided the Lech Walesa Institute Foundation in Warsaw "biggovernment.com plus other news source" - not Lech Walesa himself - and that they were "thankful." Ever write a letter of complaint to a company, organization, or politician and get that letter in response thanking you for your words? This is exactly what it sounds like Andrzejewski received. Nowhere does he state that Walesa changed his mind regarding Occupy Wall Street. The original comments made to the Associated Press were made on October 13th. Andrzejewski's little Big Government post regarding his informing the Lech Walesa Institute Foundation was made October 21st, yet just two days ago, Lech Walesa reaffirmed his support for the Occupy Wall Street movement. “The banks get taxpayers money, and they don't feel any shared responsibility for the economic crisis,” the former president said in an interview with Polish tabloid Fakt. “Do you know how much money bankers make? Heavens above, it's a crime,” he declared. “People are dying of hunger and they're not showing a sign of moderation,” Walesa said. The former Solidarity leader concluded that a radical rethink is called for to remedy the situation. Does that sound like a the complete reversal Big Government's propagandists talk about? This isn't the first time Big Government referenced Walesa either - they believed Walesa's denial to meet with the president during his Polish visit was a snub, due to a difference in politics (the right insists Obama is too liberal for the former Polish president). How different are Walesa's comments above and those made by President Obama any different? Sounds as if conservatives are trying to rewrite history to gain another hero, similar to their treatment of Ronald Reagan or defense of George W. Bush. Update - When confronted with the facts, the recipients of the propaganda choose not to do any research of their own, instead choosing to remain irrational and illogical. Apparently, my offering evidence that Lech Walesa's support hasn't diminished is proof to the fools at Big Government that he no longer supports the movement, and no comment would be complete on these sites without the standard insult referencing either intelligence or liberal political stance. They could not even offer any corroborating evidence - either a press release from Walesa himself or Occupy Wall Street - to support their claims that they convinced the Polish hero to not support this growing movement. They truly are fit to be tied and the do not know what to say because of their hatred. Obama is just killing them figuratively because he is actually killing very bad people who have killed Americans. You really need to go to the Bigpeace website. Their is an article congratulating Obama and then the author alleges Obama is "starting to like" it. When reading the Lech Walesa article on Big Government and how they go about their problems - some guy forwards Big Government and other "news" articles to Lech Walesa's foundation - and then takes their boiler plate response as proof he made a difference, it is quite telling how delusional these people are. AND I read that Big Peace post - it had no substance. Your response was great and reminded me of what Bill Maher had said on his show last night. Obama's greatest successes as president have been when no Republican has been there to obstruct him - foreign policy. Also, the response to your comment is funny. These Big clowns complain Obama is weak against foreign powers, praise Bush for taking Ghadafi's nukes away, and then lambaste Obama for apparently being too strong and going against his word against a nation that sponsors terrorism. My opinion is that Obama's actions were appropriate, in both Libya and in other of the African and Middle East situations. Obviously, going into Afghanistan was correct. However, the mistake we made in both Iraq and Afghanistan is we been there too long. The reason for this is the more they had internal squabbles, the more money we threw at them. We needed to demand more from their governments and if this did not work we needed to leave. To quote Charlie Wilson, "These things happened. They were glorious and they changed the world... and then we fucked up the end game."